There are many reefs and a number of wrecks off the Gold and Tweed Coasts. There are the wrecks of the Scottish Prince, the SS Alberta and Fido Wreck. The reefs string all along the coast. Here is our pick of the bunch. This is one of the most popular areas because it has a good mixture of southern and tropical fish life. Cook Island lies about half a kilometre off shore with depths varying from 12 metres down to about 18 metres. Along the coral gardens are drop offs with small caves, protruding ledges covered with colourful growth and a large number of fish. Giant Queensland Groupers glide in and around the bommies that lie out in the sand. In January Leopard sharks hang out here for a month before heading to places unknown for the rest of the year. In the colourful coral gardens there are turtles, red morwong, schools of zebra fish, and snapper mixing with an infinite variety and number of tropicals, very much like a big aquarium. This spot suits new divers, photographers and experienced divers. Southeast of the tweed river entrance this large expanse of reef reaches up from a depth greater than 20 metres to less than 7 metres below the surface. It is a haven of fish life, with large varieties such as Qld Grouper, mackerel, snapper and yellowtail intermingling with the smaller tropicals. Sponges, corals and sea fans decorate the reef, a colourful mixture of northern and southern varieties. There are a number of spots to dive at this site. A popular spot is a sandy gutter with walls up to 10 metres high on each side, decorated with an amazing selection of soft corals. In addition, several small caves run near the gutter that houses many angel and butterfly fish. This is a great dive for advanced divers, with good spots for those who are less experienced. 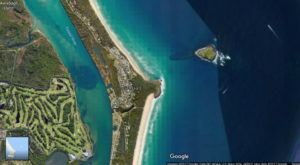 This is a large chain of reef systems spreading out from beyond the Kingscliff River. Experienced divers can enjoy deeper dives if they wish, while shallow diving offers the same brilliant array of marine life and interesting topography to those less experienced divers. There are excellent swim throughs, caves, gutters, ledges and bommies that all harbour many small fish and crustaceans. Larger pelagics are seen swimming around the reef and there is a variety of colourful sponges dotting the reef. The visibility is often 20 metres plus. More than 100-year-old shipwreck. Very easy dive. 6-12m. Large expanse of reef. Lots of tropical fish and leopard sharks. 6-22m. Instruction area. Excellent skin-diving. 6-12m. Excellent deep dive with large ballast rocks stacked on the sand. 23-33m. This reef emerged from the sand after a storm in October, 1993. We have been watching it grow from a barren rocky reef to an area covered with marine growth and kelp forest. Good dive. 12-18m. Huge expanse of reef with almost 15 different dive sites. Ideal for drift diving and exploring. Has a 90-year-old wreck, the SS Fido. 4-24m. Only partially explored. Elle’s Wall – 8m face with grey nurse sharks. 15-3m. Deep, advanced dive only. Spur of reef with big splits and caves joining most of them. 16-35m. Superb advanced dive. A pinnacle of rock coming out of the sand with a cave on the south side and a semi-flat top. 16-33m. More than 100-year-old shipwreck. Excellent shallow dive and ideal skin diving. 6-12m. An underwater island very similar in shape to Cook Island. Great for exploring with caves and tunnels, sheer and gradual walls. 12-28m. Still only partially explored due to frequent strong currents and dirty water. Worth exploring. Has wreckage of unidentified shipwreck. 13-28m. Deep dive. Advanced only. The reef rises only 5 metres out of the sand. Superb fish and coral life. Grey nurse sharks and large pelagic fish. 30-35m. Open water to advanced dive with sheer walls, caves and tunnels. Grey nurse sharks and leopard sharks in season. Hundreds of fish. A top dive. 12-28m. We have too many different dive sites to describe them all. These are just a few. We are also finding new dive sites all the time, so come exploring with us.